Sky: A dreary morning with gray stratus clouds all around and an occasional misting of precipitation. Much brighter sky by 1300 — enough to cast shadows, but remained mostly cloudy throughout the day. A pleasent evening with clearing skies. Longline retrieval started on a bad note this morning as the line went under the ship. It caused only a short delay as maneuvers were quickly and successfully made to keep it out of the propellers. We brought up an escolar, 2 snake mackeral, and a broadbill swordfish head. A large, angry silky shark came in also. The shark was released after being tagged and “kindly” relinquishing a remora. And finally, a new species for the record, a lancetfish (Alepisaurus ferox). These guys look much like the snake mackeral, a long thin body up to 200cm, nearly cylindrical with a tall uneven dorsal fin (sail)standing perhaps 5 body widths high over nearly 2/3 of its back. The snake mackeral’s dorsal fin does not rise nearly so much. The lancet’s skin was very smooth, scaleless in fact, iridescent and rather pale. They have narrow snout with long sharp teeth. For those interested in the studies of pelagic fishes, the Pelagic Fisheries Research Program (PFRP) publishes a newsletter which can be viewed online (I think) at http://wwwsoest.hawaii.edu/PFRP . For more on the eye work being done by Kerstin and others see Vol. 6 Number 3 (July-September 2001). The remoras are being collected as a favor for her labmate’s work at VIMS. That person is looking at the phylogenetics of remoras and also that of their hosts which include sharks, billfishes, and the occasional baitfish or float. She is also collecting fin clippings from sharks of the genus Carcharhinus (e.g. oceanic white tips, silky sharks) for another labmate working on the sandbar sharks (also in the Carcharhinus genus) off of Virginia, looking at natal homing patterns. From the plankton tows, Melissa is interested in larvae of the fish family Scombridae which incldes tunas, wahoo, bonitos, and mackeral. Can we find ways to identify them based on their genetics? Samples from all will be sequenced using their mitochondrial DNA in an attempt to find unique interspecific (between species) genetic markers. The value of this is that it would allow easier identification of larval types than does morphological identification. We might more readily then identify where and when particular species spawn and thereby attain a better understanding of their life histories. Are the genetics of a species uniform throughout the range of the fish? If there are significant genetic differences in populations then perhaps it is wise to manage fisheries of that species by area as opposed to globally (one size fits all approach) so as to preserve gene pool diversity. Answers to these questions could lead to management practices that better protect these resources. This work also has applications in forensic studies. Fish that have been taken illegally and already filleted can be identified by genetic markers enabling better enforcement of regulations. Also, morphological identification of degraded tissue, as in stomach contents where enzymes have done their deed, is impossible. Stomach contents collected here will be screened using genetic markers for the tuna larvae to see if the larvae are part of that particular fish’s diet. Applications from this work could potentially aid studies of trophic levels and predator/prey relationships. Suffered my first injury in shark wrestling today with a slight abrasion to left knee — not enough to scare me away from the next match. Nothing too news worthy to report about the day. It was a rather slow day. Not much sun, humidity was above the norm — a bit uncomfortable outside. Continued reading Wilson’s book, did wash and stewards offered a linen change today which I took advantage of. There was a moment of excitement this afternoon when a marlin took off with a troll line. It was out of control and our two champion fisherman couldn’t handle it. Gears were stripped in the reel which actually smoked from the heat generated as line spinned off. That rod is out of action for the duration; the fish won that round. This evening our electronics technician, John, gave me a pictorial introduction to other research cruises of the SETTE which I will share with you another time. And, relieved of longline duties tonight, I spoke with Mike and science in general and some specific regarding his work in fisheries research. To all of my ’02-’03 Advanced Biology students, I am sorry to report that I was not able to make use of my Secchi disk nor did I even see one on the ship. What does the term upwelling mean? Identify several general locations in the oceans where upwelling occurs. What is the biological impact of upwelling in those areas? 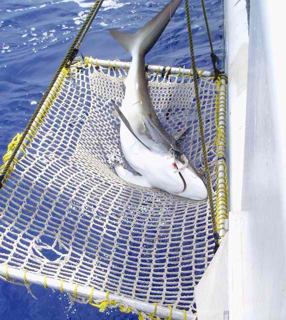 This entry was posted in 2004, Geoff Goodenow, NOAA Teacher at Sea and tagged forensics, hawaiian islands, longline, NOAA Ship Oscar Elton Sette, Pelagic Fisheries Research Program, phylogenetics, silky shark, Swordfish Survey, upwelling. Bookmark the permalink.